In this study, Elizabeth Mann and colleagues asked health care proxies (generally family caregivers) of nursing home residents with advanced dementia a series of open-ended questions about Do-Not-Hospitalize orders. 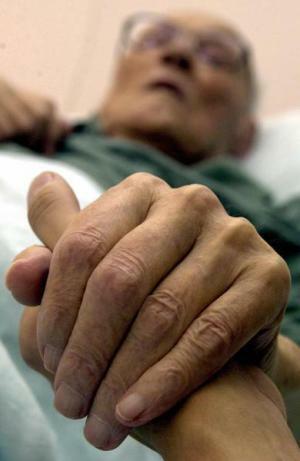 Hospitalizing patients with advanced dementia is often (though not always) more harmful, leading to potentially burdensome and painful interventions (feeding tube insertion, needle sticks, restraints). All decisions to hospitalize must be made in the context of the patient's goals and the risks and benefits of hospitalization, and alternative, namely, ongoing treatment in the nursing home. 10 nursing home residents had a Do-Not-Hospitalize order. None were on hospice. Many did not understand what a Do-Not-Hospitalize order meant. Three thought they had placed a Do-Not-Hospitalize order when they had not. Many were not aware that their loved ones with advanced dementia would inexorably decline. "Right now she's not on physical therapy, which they took her off....She's not walking...She used to walk. So I would like to get her walking again." "I could not imagine my mother falling and breaking her hip and not going to the hospital...Because I think that would be very painful for her. And [it] would be cruel. And someone could say well what's the difference between having pneumonia and not going to the hospital and breaking an arm and not going to the hospital. And I don't know that I can answer that except in my mind there is a difference..."
There are two issues here. The first is the need for doctors to ascertain and document the degree of flexibility or leeway that patients give proxies for situations like this. For example, "I don't want to be hospitalized for any reason. Period. If I break my hip, just keep me comfortable in the nursing home." Or, "Let my husband decide. No one can predict for sure what will happen in the future. Do I want to stay out of the hospital? Yes, of course. But I can't say never." The second major issue is the suboptimal understanding of health care proxies of nursing home residents with advanced dementia about prognosis and risks and benefits of hospitalization. In many cases, this misunderstanding results from a proxy-clinician communication failure. Elderly patients frequently suffer from delirium when hospitalized. When my husband's doctor informed us of this, my children and I decided against having him undergo surgery for the broken hip he had sustained in his nursing home. At age 89 he was not demented but had suffered from severe depression for a long time. He certainly did not need further mental illness. Now, at 91, though confined to a reclining wheelchair he still enjoys visits, including outings on the home's grounds. Would he have survived nearly two years after surgery and hospitalization? Several of his friends in the facility did not.